For almost 30 years, when I've presented my portfolio, I've offered the entire shebang of prints to the person who could identify the subject of this photograph. My portfolio still remains intact. This was a snow-covered diving board over a snow-covered lake in Northern Wisconsin on a ferociously cold day. It's an old fashioned diving board with large springs underneath the wood plank. 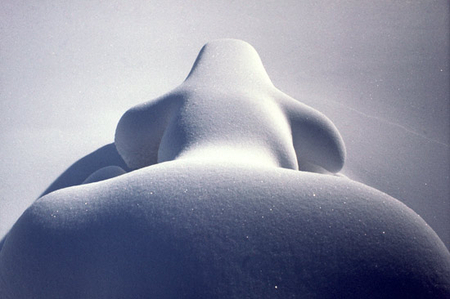 One of the most frequent guesses is a close-up of the nose of one of the presidents carved on Mt. Rushmore.